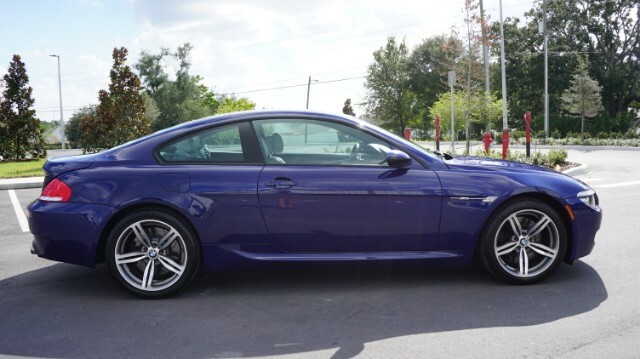 Stunning BMW M6 Coupe. 500hp V10 Engine. Only 56k Miles! Interlagos Blue with Silverstone Full Merino Leather. Loaded with Options Including: Heated Seats and Steering Wheel, Comfort Access, Soft Close Doors, Carbon Fiber Interior Trim, Park Distance Control, Adaptive Xenon Headlights, Navigation with Real Time Traffic, Heads Up Display, HD Radio with XM and More. Serviced since day one, 2 owner car, and never smoked in. This car is in immaculate, garage kept condition. You will not find a nicer one. Clean Carfax report. Newer Michelin tires. Will ship within the US at the buyers expense. Call Todd @ 321-231-4690 for more details. Visit us on-line @ TTHMotorgroup.com - trades are welcome.